45 w w w . M o d e r n T i r e D e a l e r . c o m • Secure Territories Available • DDP Pricing • Full Line: PCR/UHP/Run-Flat/Winter/LT • Passenger, UHP, Light Trucks, Run-Flat and Snow Tires • Petlas has an ISO 9001 Quality System Assurance Certificate • Exports to nearly one hundred countries worldwide • Petlas Tires have passed all US DOT, European ECE, Inmetro, and CCC Certification • Global Production of 10 Million Units per Year • NO TARIFF / NO ANTIDUMPING / COUNTERVAILING • Industry Warranty Accepting Dealer Applications Nationwide Oriente Tire USA, LLC. Petlas Tire USA, LLC. Office: (786)573-0757 info@orientepetlas.com David R.J. Halldane, Sales Director Tel: (805) 218-5205 or email: david.halldane@orientepetlas.com www.orientepetlas.com BECOME A PETLAS TIRES DISTRIBUTOR TODAY! TRACK OF TRUST Global. e company currently has one manufacturing facility in China with an annual production capacity of 4.6 million TBR tires and 6.5 million PCR tires. Due to elevated tariffs, there are no current plans to sell passenger tires in the U.S. e company, which previously operated as Cooper Chengshan (Shandong) Tire Co. Ltd., continues to supply Roadmaster brand truck tires to Cooper Tire and Rubber Co. 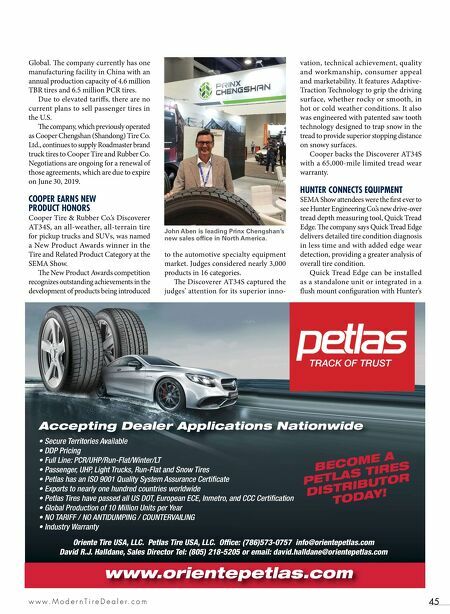 Negotiations are ongoing for a renewal of those agreements, which are due to expire on June 30, 2019. COOPER EARNS NEW PRODUCT HONORS Cooper Tire & Rubber Co.'s Discoverer AT34S, an all-weather, all-terrain tire for pickup trucks and SUVs, was named a New Product Awards winner in the Tire and Related Product Category at the SEMA Show. e New Product Awards competition recognizes outstanding achievements in the development of products being introduced to the automotive specialty equipment market. Judges considered nearly 3,000 products in 16 categories. e Discoverer AT34S captured the judges' attention for its superior inno - vation, technical achievement, quality and workmanship, consumer appeal and marketability. It features Adaptive- Traction Technology to grip the driving surface, whether rocky or smooth, in hot or cold weather conditions. It also was engineered with patented saw tooth technology designed to trap snow in the tread to provide superior stopping distance on snowy surfaces. Cooper backs the Discoverer AT34S with a 65,000-mile limited tread wear warranty. HUNTER CONNECTS EQUIPMENT SEMA Show attendees were the first ever to see Hunter Engineering Co.'s new drive-over tread depth measuring tool, Quick Tread Edge. 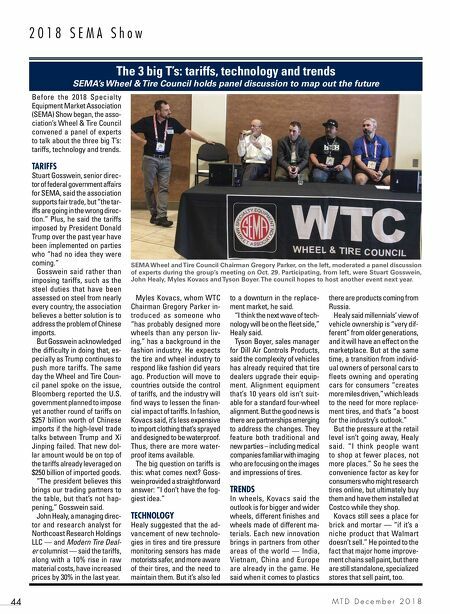 e company says Quick Tread Edge delivers detailed tire condition diagnosis in less time and with added edge wear detection, providing a greater analysis of overall tire condition. Quick Tread Edge can be installed as a standalone unit or integrated in a flush mount configuration with Hunter's John Aben is leading Prinx Chengshan's new sales office in North America.